Microsoft have invested tens of millions in their hosting centres, surely as an Office 365 user your data is safe right? An important point that’s all too often overlooked by businesses moving to Office 365, is that the responsibility for your data does not lie with Microsoft. They operate a shared responsibility policy, which means it’s the uptime of the service they’re concerned with. There are no provisions for restoring your messages or mailboxes if they’re somehow compromised, the backups they have are purely for disaster recovery. E-mail archiving is an indispensable tool in the armoury of any company looking for a secure but accessible way of storing email. It’s also an excellent way to tick a number of the boxes of the General Data Protection Regulation (GDPR). 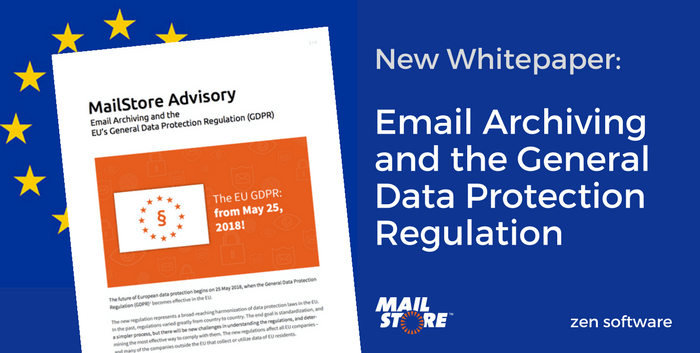 I touched on this topic in a recent YouTube video and today the German vendor MailStore have released a new whitepaper detailing exactly how to fully support your GDPR compliance customers, available here. Great news – it’s here, and it’s available for download now via our website. 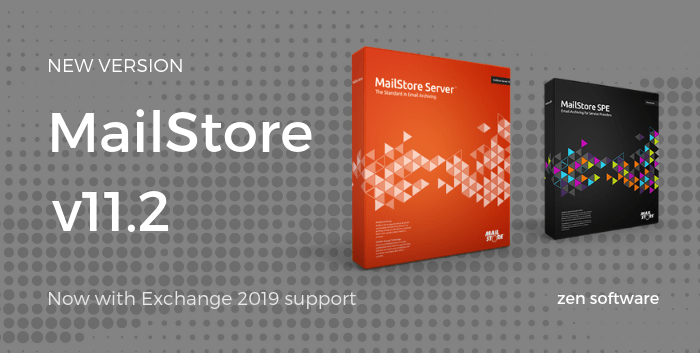 It’s the latest update to MailStore Server, the email archiving software for Office365, Exchange and MDaemon. 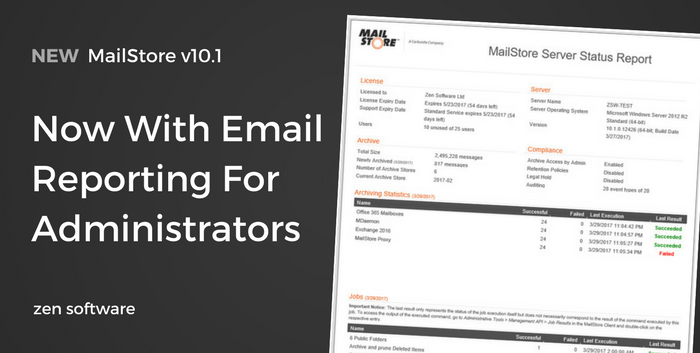 The highlight is a complete overhaul of the web search client, plus the introduction of digital signing for exported email in all three versions of MailStore. Last but not least, this release also sees the introduction of ‘status reports’ for the Service Provider edition. The developer’s blog announcement mentions they’re ‘bringing the user experience and security to a new level’. I can’t argue with that from what I’ve seen so far, and the particularly interesting part is that this release is the developmental stepping stone for lots more in the way of improvements in the months to come. Following on from the recent announcement concerning the reduced entry requirements for becoming a MailStore Service Provider, our colleagues over at the German developer have released a number of webinar dates over the coming weeks. These sessions are a fantastic opportunity to hear directly from the developer and to raise any questions you might have following the short presentation/ walkthrough. 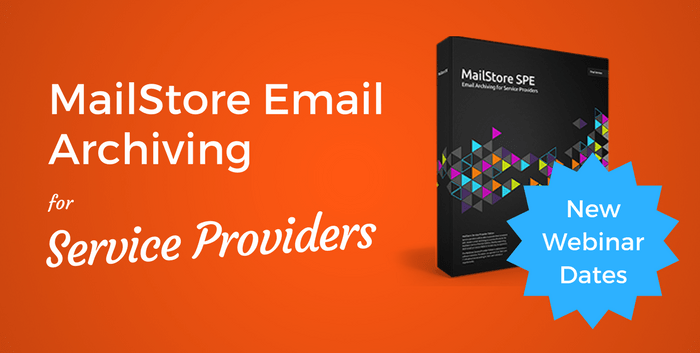 If you’re thinking about building your own archiving as-a-service platform and becoming a MailStore service provider, this is the perfect way to find out more without any pressure or obligation to take it further. 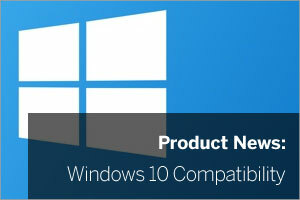 Unless you’ve been living on a remote island for the last couple of weeks, and also covering up your Windows task bar every time you use your computer, you probably know that Windows 10 is now available to the masses. Yes, Microsoft’s new flagship desktop O/S is upon us in all of it’s glory. It’ll take some time to see whether the hype was justified, and of course to discover the new features (and quirks), but if you’ve already upgraded or are thinking about doing so, you’ll no doubt be keen to know how it interacts with our products. In this update I’ll detail what level of support (if any) is currently offered for each of the products we distribute. 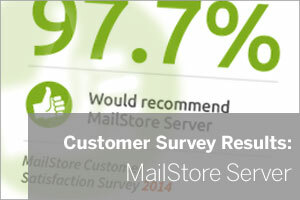 Our friends over at the German developer of MailStore Server have been busy conducting an international survey of 480 customers in the United States of America, Canada, Australia, New Zealand, Great Britain, the Netherlands, Belgium, Germany, Austria, and Switzerland. Respondents were asked to rate the popular email archiving software in terms of documentation, support, product features from the administrator’s and user’s point of view, and the price/performance ratio. We’re very pleased indeed to report that the response they received is in line with the glowing feedback we always hear as the UK distributor. 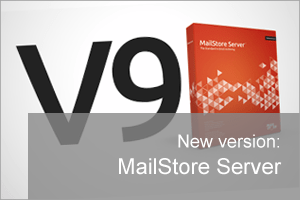 The launch of the latest and greatest version of MailStore Server was announced today by the German vendor.